The Federal Reserve announced Wednesday it will slowly begin scaling back its effort to boost the U.S. economy, which has helped to keep interest rates low. That could be considered good news overall — it's a sign the nation’s central bank believes the economic picture is clearly brightening — but it’s not such great news for anyone looking to buy a house in the next few months. The Fed decision could spur a further bump in home loan rates, which have already climbed more than 1 percentage point since May. 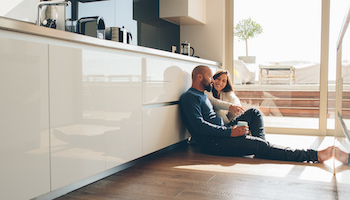 Home loan rates began to climb last spring when Fed Chairman Ben Bernanke first announced the Fed was likely to shift gears later in the year. To keep the economy afloat, the Fed has been making regular $85 billion monthly purchases of government securities and mortgage-backed bonds. Those purchases have essentially flooded bond markets with money, helping to boost the economy by keeping long-term interest rates low. But Wednesday, the Fed said it would trim those monthly purchases to $75 billion in January. While emphasizing that the Fed could change direction if the economy slowed down again, Bernanke, speaking after the announcement, said, "My expectation is for similar moderate steps going forward through most of 2014." But Bernanke also said the Fed will continue to pursue other policies intended to keep interest rates low overall, including mortgage rates. How much difference that reassurance will make in home loans is uncertain, considering mortgage rates began rising last summer just on speculation the Fed would act. With the economy improving, the Fed was widely expected to announce it would begin trimming these purchases at the meeting of its rate-setting committee held last September. However, at that time the Fed surprised many analysts by saying conditions were still too uncertain to begin bowing out. That decision led to a brief fall in mortgage rates, which tumbled about half a point in the month after the announcement, before they resumed their climb. Despite the Fed’s September decision, a spate of good economic news in recent weeks again had fired expectations that the Fed was about to change course. Analysts cited unexpectedly strong economic growth in the third quarter of 2013, a decline in the unemployment rate to 7%, the lowest in five years, and a tentative congressional budget agreement that could eliminate the possibility of government shutdown as reasons why the Fed would decide it could step back. This time they were right. "Today’s policy actions reflect the (Fed’s rate-setting) committee’s consensus that the economy is continuing to make progress," Bernanke said. 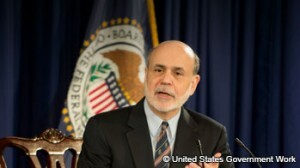 The Fed chairman particularly cited gains in employment as a factor in the Fed decision. "Recent economic indicators have increased our confidence that job market gains will continue," he said. Still, the news seems likely to send at least a modest jolt to rates. The average rate for a 30-year, fixed-rate mortgage was 4.55% last week. Some market observers predict the 30-year rate could climb past 5% as the Fed scales back. Rates in that range would be reasonable from a historical perspective. Borrowers typically paid 5% to 6% for 30-year mortgages during the early 2000s, 7% to 8% during the mid- to late-'90s, and more than 10% throughout the '80s and early '90s. But 5% would represent quite a jump from the rock-bottom rates of the last few years. 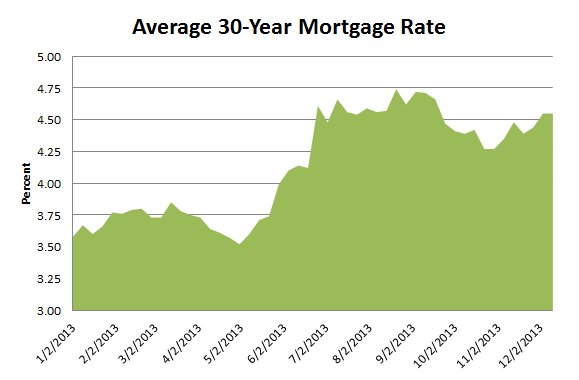 Just last May the average 30-year fixed rate was 3.35%. Home sales have been picking up this year, which could also help push mortgage rates higher. Where will rates end up? No one can say for sure. It depends on housing demand, the strength of the economic recovery, the level of inflation and other factors. The Fed’s decision Wednesday, however, means the central bankers feel the economy is finally headed in the right direction, even if home loans do become more expensive.